LP met een gewicht van 180 gram, gemaakt in Duitsland door Speakers Corner Records. Puur analoog, audiofiele mastering vanaf de originele mastertapes. Originele uitgever: DGG. Leveringsomvang: 1 x 33 toeren langspeelplaat in een LP cover (350gr/m2) met gevoerde binnenhoes. Planète Disque verpakt iedere LP zorgvuldig in een stevige doos met opvulkartons en een luxe plastic buitenhoes van PVC. Although he has lived in the USA since 1929 and even took on American citizenship in 1942, Nathan Milstein is often referred to as perhaps the last “Russian” among all Russian violinists due to his art of playing – which is governed wholly by intellect. This does not mean that Milstein plays in an academic or cool manner; his art is thoughtful and controlled – in the very best sense of the meaning. And this should certainly not be equated with “deliberateness”. On the contrary. Milstein’s tremendous virtuosity, particularly in the fiendishly difficult final movements of Tchaikovsky’s and Mendelssohn’s concertos, takes both works to new heights. Although never a forceful presence since he employs relatively little vibrato and thus achieves a slender tone, Milstein’s playing is filled with amazing assertion and luminance, and is quite fascinating for its extraordinary purity. 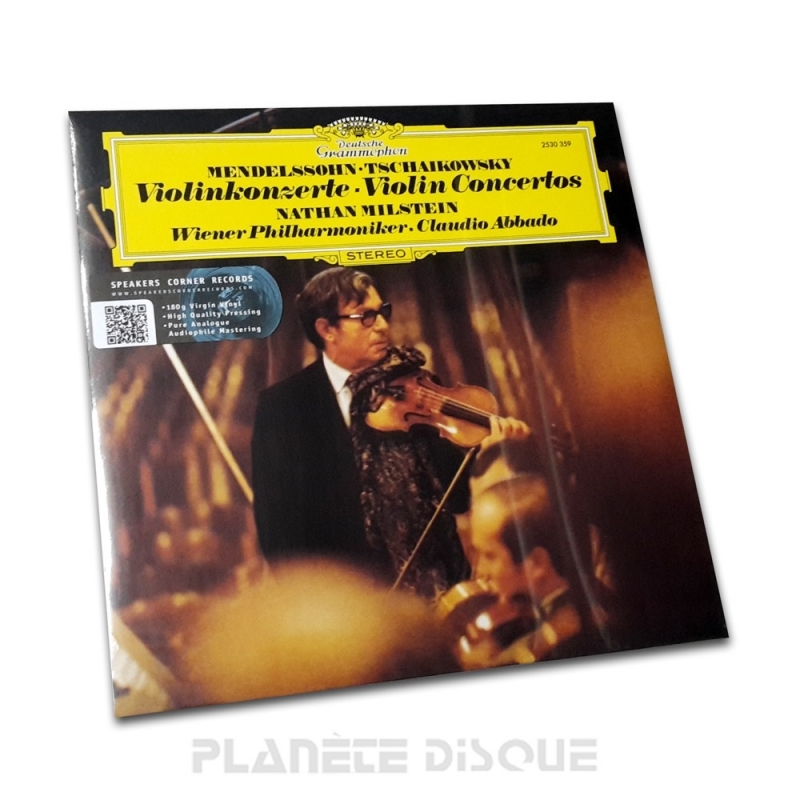 And this is precisely what enhances his interpretation of these two great classical concertos, lending them a legendary grace, a feeling of rightness – that there is no other way. The Vienna Philharmonic with their great tradition provide support of the first order, and Claudio Abbado proves once again that he is a more than circumspect master of the baton.